In a food processor equipped with the slicing blade, run the Brussels sprouts and onion through to shave. In a skillet with a lid, heat the ½ tablespoon of olive oil over medium-low heat. Add shaved Brussels Sprouts and onions, cooking for 1 minute. Add in 2-3 tablespoons water, cover, and let cook until Brussels sprouts are tender, 6-8 minutes. Remove lid, stir, and continue to cook until any liquid is gone, 2-3 minutes. 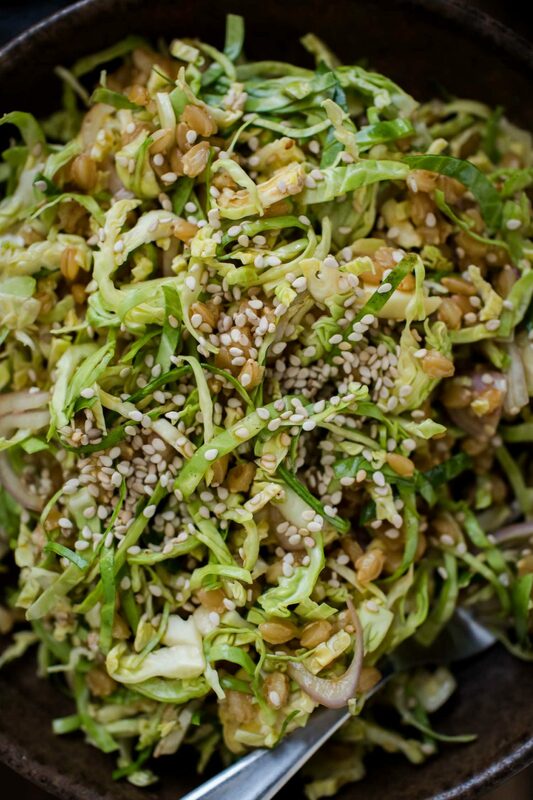 In a bowl, toss together brussels sprouts, einkorn, and sesame seeds. In a separate bowl, whisk together the remaining ingredients. Pour over the salad and toss until well combined. **I don’t like an overpowering mustard taste however, more mustard can be used. Taste and adjust as needed. 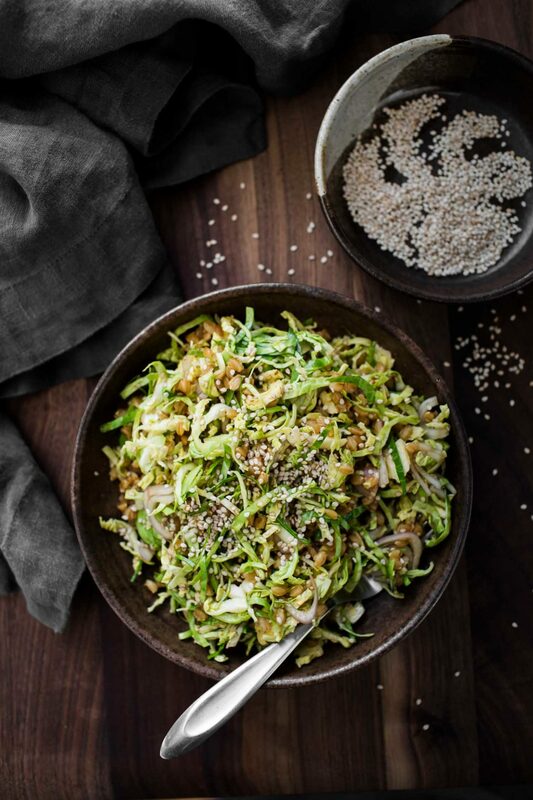 If I have Brussels sprouts that are on the verge of losing their crispness, I make a Brussels sprout salad like this one. Shaving the Brussels sprouts cuts down on the cook time and hides any imperfections on the Brussels sprouts. Grains: This salad really relies on the grains and the slight chewiness from the Einkorn. Traditional wheat berries would make for a nice swap or if you’re looking to make this gluten-free, use sorghum. Soy Sauce: Looking to make this soy free? Use Coconut aminos. Add ins: Most fall flavors would be great add ins but a couple of my favorites are roasted butternut squash or shredded apples. This sounds absolutely fantastic Erin. I’m in love with the soy-mustard dressing. I’m especially loving that dressing! This looks great! I’m going through a shaved Brussels sprout phase in my kitchen, so I’ll definitely be making this soon! That’s definitely a great skill to have in the kitchen but it sure does take some time to acquire it. I used to only have two meals in my repertoire and it was probably getting sick of those two meals that caused me to start trying new things. 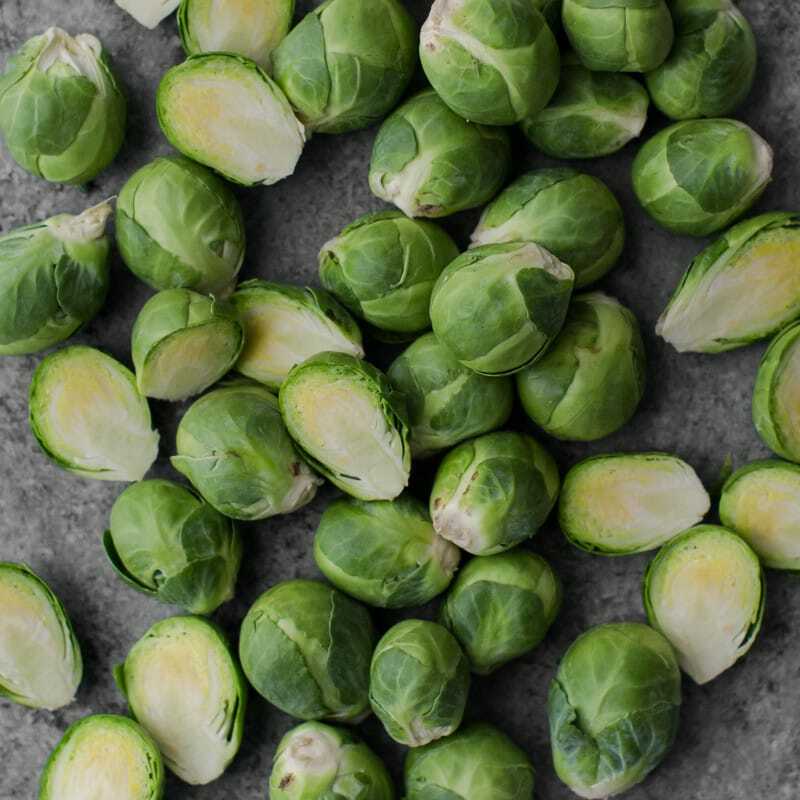 🙂 I’m in love with brussels sprouts right now, definitely pinned. Definitely takes time and I can imagine that two meals did become slightly boring 🙂 I had I think three and even those weren’t great! I’ve definitely gotten better at just throwing things together…having to do it out of necessity often helps! (I.e. I’m starving and there are only these five ingredients in the fridge). I haven’t eaten enough brussels sprouts this season, so this salad will definitely help me get more in! You always inspire me with how creative your meals are! I love seeing the combinations you throw together! This post reminded me of how I always had to follow a recipe word for word when I first started cooking. Now, I don’t think I could follow a full recipe to save my life (which drives the boyfriend crazy) – there is always something in a recipe that sparks an idea to try adding or omitting or substituting to make it my own. Ha! When I first started shooting recipes that weren’t my own, I had friends doubt that I’d be able to make the dish as is just to get the shot. I’m notorious for never following a recipe 🙂 But hey, when creativity strikes! What awesome flavors with the soy sauce and ground mustard, two things I love a whole lot! Hoping there’s some Brussels Sprouts growing in the greenhouse, if so, this dish will be on! I hope you can find some! I think you’ll really dig this dish! That dressing looks amazing! I make a brown rice, roasted broccoli and chickpea bowl I bet it would be fantastic on! Oh yes! I think I’ll have to try that out! Oh, I just love tamari! So much more flavor than standard soy sauce. This dish looks right up my alley. Shaving sprouts is such a great idea. I love the cabbagey taste, but don’t like the ball of boiled sprout texture. This was fantastic. Did not have einkorn berries so replaced with barley. Thank you for this recipe! I think this recipe sounds delicious. Since I am soy free and I always trying to find a substitute for soy though. I would like to add that Bragg liquid aminos is derived from soy and therefore is not considered soy free. Ah, thank you- I’ve updated it to be coconut aminos instead. I do the exact same thing! I start the heavy meals early on but as the winter wears I need something liter. Thanks for this recipe. I just love Brussel Sprouts. Yummy!